I'm currently semi retired and would like to do something part time while during my free times. Thinking of driving PHV but i'm driving a BMW 523i with 13L/100KM fuel consumption. Still viable to drive and earn a profit ? I'm planning to drive during peek hours about 8 hours a day. Would really appreciate some bro's genuine advise. Thanks in advance. Stop. Rent a car for a week first and try out. See if you want to subject your bmw to the harsh traffic mileage first. I fear you may be disappointed at the end of the day. 1. Tyre replacement - bmw 17 inch? 5. Your fares expect to get fk fares 80% of the time. If you work 8 hr. 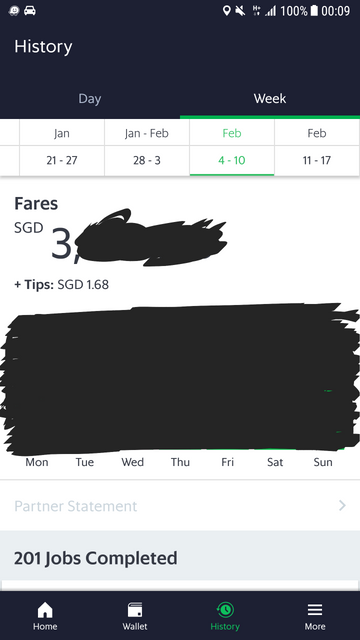 Expect around $25/hr GROSS fares ( haven’t inc com) . This includes surges and all. Some hours u get $15/hr some hours you get $50/hr. Average out $25 - $30 ( emerald tier ). If you 8 hr x $20 ( NETT) = $160 x 30 = $4800 ( max) Fuel I expect $2-2.5k for bmw. So you are left with say $2k net. Finally , last main issue. Unless your scrap your car, your car will have super high mileage at the end of 1 year. U want to sell your car, value drop. So likely will need to take scrap + Parf value + body value. Worth it or not? 201 job already pass 3k. Last week, I only needed 60 gems to get $48. This week, need 90 gems to get only $60. Sigh. Difficult to get 90 gems for part timers like me unless if I drive on weekends as well. Bullsh*t!! I have my own car already fully paid, driving PH for additional income and to relieve stress after work. So it ideal to just whack. Not feasible to rent either. Bruder not gg full haul isnt it, hopefully. Seriously, customers dont care owned or rent etc. Thanks all bros for the information. Now I can be sure I can convert my bmw 523i 2.5L into Z10 and start the PHV job for my free time and not worry about the fuel consumption. I think base on the information by all nice bros here I can get a decent part time income driving 8-10 hours daily during peak hours. I'm happy with 3-4k income after deducting all expenses to drive and pass my time. Hope to see you guys on the road. Gd luck and safe driving for all bros here. Unless you want to do premium. However, most of the time, the job you'll be getting is Just Grab, normal Grab car job with low fare. Your fuel will be a killer, next is your servicing and wear and tear. Insurance will be much higher too. Hence highly recommend is bread and butter car. Anyway put another note. Own car or rental car what is the difference. Even if you buy a car, you are also renting from garment for 10 years, after that renew 5/10 years or scrap. It's not as though we really own the car. Own something means you can keep it forever until you throw. 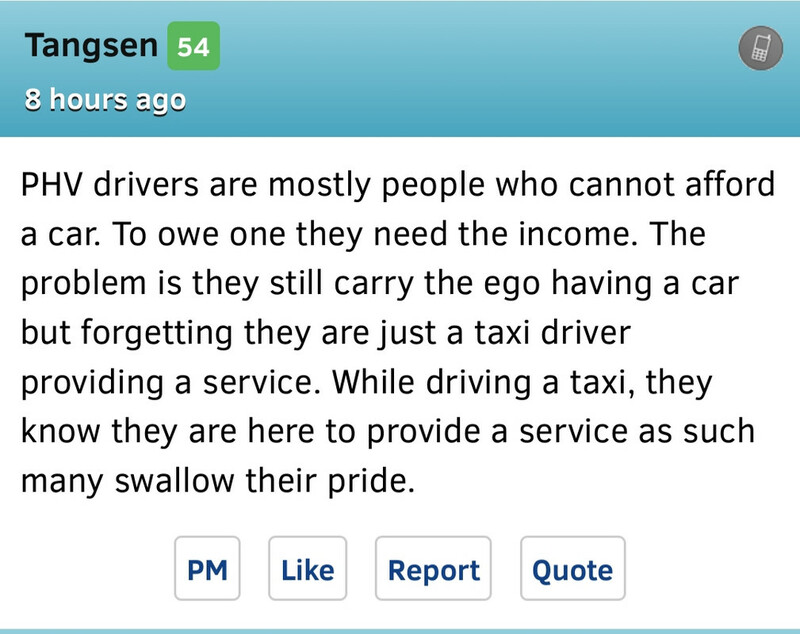 The only difference is probably own a car is cheaper than rental long run for phv. For rental, there is no long term commitment which is the advantage. One fine day you stop phv or lose a full time job, you can get rid of car easily. So smart choice is still rent car. If can afford of course buy a car can save some money for phv or personal use. Anyway who care as long as rider reach destination safely most important. There's always people who got red eye. Don bother. If one to say something there is always things to say with practically everything. Last edited by Rangefighter; 11-02-2019 at 08:31 AM..
Max for new wheels is 120months only. All turned to smelly metal after. I think PA really allocate all the 678 to yall. Really dun smell much 678 nowadays. Last time can 4-5 trips per hr. Now cant even.